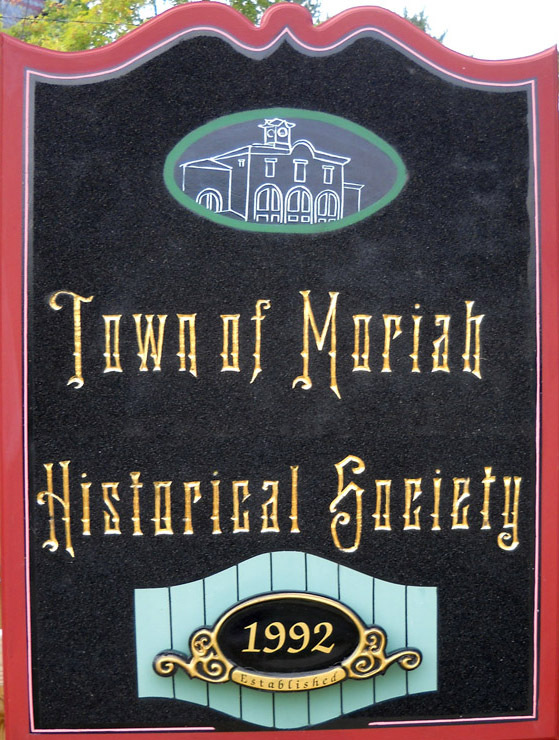 The Town of Moriah Historical Society organized in October 1992 to collect and preserve old photos, historical information and items that have significance to our community's history. Some of these will be on exhibit in our headquaters at the IRON CENTER. The Society is active in preservation, geneology, and education. Moriah has a very rich and versatile heritage. After the Treaty of 1763, soldiers were given land by King George for their service in the French and Indian War. Iron ore was discovered, lumber & grist mills sprang up, farms started, furnaces were built, and the shipping of ore started, first by water and then by railroad. Many families came to work in the iron ore mining industry, which flourished from around 1824-1971. Mines were privately owned, then became the property of Witherbee-Sherman & Co., and finally in 1938, Republic Steel Corporation. In the late 1800's and early 1900's most of the large hotels, homes, churches, and schools were built, many still existing today. In the early 1900's, ice fishing became quite an industry. Ice fish (smelt) were shipped to the better restaurants in New York City & Boston, so that people there could sample these sweet-tasting delicacies. Ice fishing is still quite a popular sport. Once the lake freezes in January, one by one, shanties are towed onto the lake. Soon there are little villages of them all around Port Henry. People warm themselves with little stoves and holes are cut in the floors of the shanties. Fishermen sit on benches and fish through the holes, using special poles. When movie making was in its infancy in the early 1920's, Port Henry had a filmmaking studio here for a few years known as "ARCTIC CITY". "The Perils of Pauline" series was shot here. Many of the stars stayed at the LEE HOUSE, a lovely hotel on Main Street which is still standing. You've heard of the Loch Ness Monster. We have "CHAMP" the Lake Champlain monster, as seen on Unsolved Mysteries. Many people have seen what they believe to be an elongated humpy creature with a head shaped like a snake or horse. Champ is very elusive but has appeared in the Bulwagga Bay area, which is at the southern part of Port Henry. Due to the lack of volunteers, we suggest you call before coming to the Iron Center Museum, as we cannot guarantee that it will be open. The Town Historian is in her office, upstairs, on most Mondays, Tuesdays, and Wednesdays from noon until 2 pm. Ring the bell by the door. For appointments please call 518-546-3587 and leave a message, someone will return your call. If you would like to volunteer to keep the museum open on a regular basis, please call the number above. For appointments please call 546 3587 or 546 7704. We have matching hats ($17) and T-shirts ($12, or two for $20) for sale. New members are welcome! Contact Betty LaMoria at 546-3587 or 546-4165.